A two week fly drive that starts in the north west of Cyprus in the foothills of the Paphos mountains and follows the coast down to Governors Beach (between Limassol and Larnaca on the south coast) before culminating in the Trodoos mountains. An ideal itinerary for those wishing to explore all of Cyprus in properties selected to escape the masses. Time to relax at the hotel and enjoy the views and their cooking. This is a good base from which to drive to neighbouring villages and the Paphos Forest. 2 Overnights at the Paradisos Hills Hotel. Time to explore Paphos, the mosaics, the Tombs of the Kings, ancient Curium and enjoy the buzz of the resort. 3 Overnights at the Axiothea Hotel. Time to explore Kalavasos and the neighbouring villages. Nearby is the Neolithic World Heritage site of Khirokitia and the excavations at Tenta. 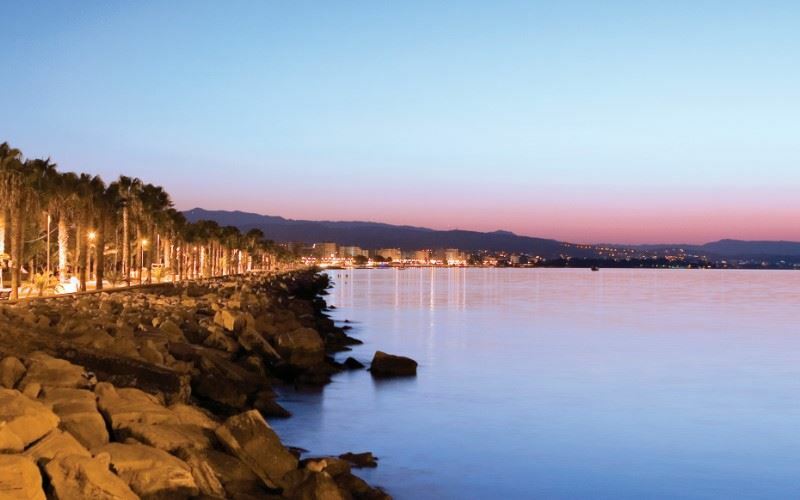 Time to explore Limassol, the bustling Old Town, brand new marina and a walk along the extensive sea front. 3 overnights at the family run Hotel Kapetanios Odysseia. Time to explore Kakopetria. Relax in a cafe under the plane trees and sip coffee and enjoy walks through the pine-clad mountains. 3 overnights at the Linos Inn. Transfer to Larnaca or Paphos Airport for your return flight to the UK. This family run, 27 bedroomed attractive, stone-built, traditionally designed hotel opened in September 2005 and is peacefully located on the edge of the large agricultural village of Lysos. This family run, 27 bedroomed attractive, stone-built, traditionally designed hotel opened in September 2005 and is peacefully located on the edge of the large agricultural village of Lysos. The views from the hotel to the sea and to the foothills of the Troodos mountains are spectacular. The 27 double or twin bedded rooms and two suites on two floors have fridge, free WiFi, hair dryer, en-suite bathroom (bath and shower or shower only or jacuzzi bath only), balcony or small terrace and air-conditioning. Being high in the hills, there are excellent views of the sea and/or the mountains. The grounds have grassed areas and ample parking. Two rooms interconnect and one room has widened access to the bathroom. The hotel has internet access, satellite television and telephones. Snacks and drinks are readily available. The hotel restaurant, under Niki's care, specialises in traditional meals served against the magnificent mountain panorama and is popular at weekends. This extends to the open terrace for meals and refreshments. The view from here, over the pool and the rolling hills, is to the sea. Niki also runs one and three day cooking classes (supplement payable upon request). The pool area (80 sq.m.1.00m to 1.5m depth) is equipped with sunbeds and umbrellas. A good location for walks in the Lysos Forest. Horse riding can also be arranged. Paradisos Hills Hotel features in our Two Week Fly Drive itinerary. They say location is everything and it is the location of the two KAPETANIOS Hotels which is so convenient for visiting Limassol. They say location is everything and it is the location of the two KAPETANIOS Hotels which is so convenient for visiting Limassol. The hotel was extensively renovated in 2015/6 and offers easy access to the centre of the city yet is only 100 metres from the beach. It is within walking distance of the Municipal Gallery, the Archaeological Museum and the old city centre with all its cafes restaurants, tavernas and bars. This is a three star superior hotel, matching many hotels of a four star status. The range of facilities on offer equal many resort hotels and are unusual in a city property. This is a very convenient base from which to visit Limassol and the surrounding region. The 159 rooms on 7 floors are freshly decorated in pastel colours and are made of standard twins or doubles, superior twins or doubles and a suite. Over a period of many years, Stelios has steadily purchased a terrace of old houses in the old medieval settlement and has lovingly restored these to create a unique 25 bedroom character inn on two floors. This was the first such renovation on the island. The inn has a sauna, a lounge / cafeteria with bar and a well-liked indoor and outdoor restaurant / taverna serving mainly Cypriot dishes. A perfect place for mountain walks with the UNESCO World Heritage medieval church of St Nicholas of the roof within walking distance. Free WiFi in the public areas and some of the bedrooms. The Linos Museum is open daily and is located on Linos Street. The restaurant also operates as a taverna serving mainly Cypriot dishes. Please note: You can drive up to the property to drop off luggage. Cars can then be parked in the official pay and display car park (local prices).